Liberal Party standard-bearer Mar Roxas II has again landed in hot waters after more snaps of his alleged misuse of government assets to gain ground in the ongoing presidential campaign surfaced online. This time, former North Cotabato governor Emmanuel Piñol, who supports the camp of presidential aspirant Davao City Mayor Rodrigo Duterte, made the exposé. According to Piñol, the photos were sent to him by concerned citizens in Zamboanga del Norte to show how Roxas’ camp was supposedly utilizing state-owned vehicles to gain undue advantage. Under the law, the use of government assets beyond official government functions is prohibited. Piñol called on concerned government agencies to investigate the issue. “We urge both the Commission on Elections and the Office of the Ombudsman to act on these reports to restore our people's trust in our government,” he said. 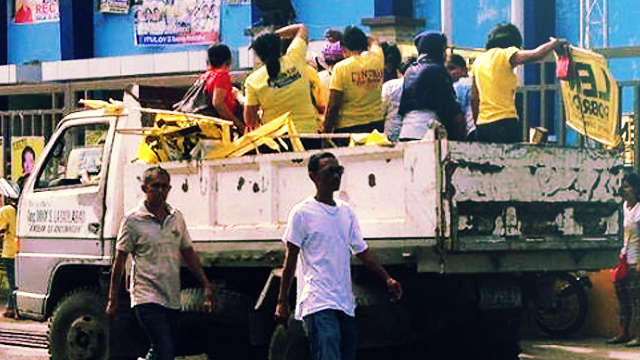 Just a few days ago, a picture of a pickup truck with a red government plate carrying Roxas’ campaign materials went viral on social media. Roxas’ camp has said that they did not authorize nor will condone these illegal practices.